Three years ago, a woman from Westlake, Ohio came to a local salon for eyebrows wax. She felt very hot at the moment it was applied, but the aesthetician assured that the temperature of the wax pot was carefully controlled. After the wax was removed, her skin started oozing and scabs began to form. She got burn! She had to go to a formal event with scabs on her eyebrows and ‘till today her skin still creepy and wrinkled. Waxing can also leave little red bumps called folliculitis on the skin especially from bikini waxes. This colud be happens when bacteria get in your hair follicles and cause a little localized infection. So, what thing you should paid attention to? Protect yourself.If the wax feels too hot, Do not continue! Even fairly minor burns on the face can leave permanent scars. Don’t use numbing products. Apply and absorbing too much lidocaine cream before waxing can be dangerous, particularly if you cover it with plastic wrap. You can’t tell if the wax is too hot if your skin’s numb. Make sure your technician has a license for waxing; a hairstylist, for instance, is not automatically licensed to wax. 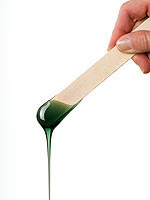 Ask for a new wax stick to avoid infection, with every application. Be sure use a clean towel or clean paper beneath you if you’re lying on a table for a bikini wax. Wash the freshly waxed area gently with soap and water to prevent folliculitis, apply a dab of antibiotic ointment, and keep it as clean and dry as possible. Don’t get waxed if you’re using an antiwrinkle or acne treatment containing retinol; get tweezed instead. The chemicals in Retin-A and similar products make your skin sensitive, so the wax can actually pull a layer off. For a bikini wax, make sure the aesthetician wears disposable gloves.